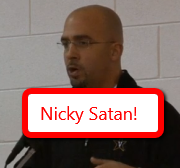 Vanderbilt's coach Franklin called Nick Saban today to apologize for the jab at Saban's name. Both are in high gear in recruiting, but Saban took a moment to speak with the young coach of Vandy about the situation that was caught on video and blogged all over social media. "Obviously, tremendous respect for Coach Saban," Franklin said. "I just got off the phone with him. Tremendous respect for them. I've got tremendous respect for what they've done. Everybody is chasing them. The guy has won three or four national championships. "(I was) really talking about the work ethic that he has a reputation for, and that we're going to outwork them. I made a joke. And in today's society with all the media and social media and people with tape recorders and things like that, that doesn't come off that way. I know people have tremendous pride in Alabama, and their fans are fanatical. So I understand. But it was a joke and I didn't mean to offend anybody." Franklin went on to say that Saban was "good" with the situation.